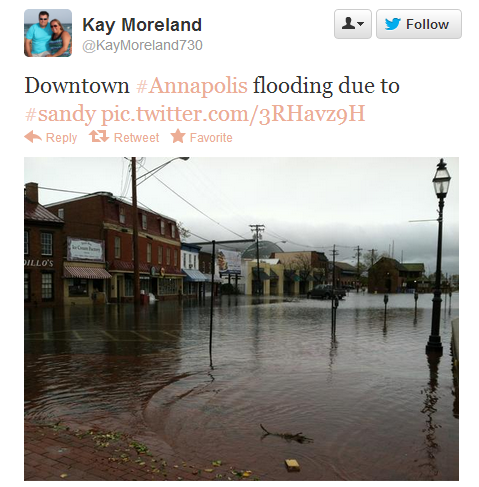 Evidence of how Twitter has become a go-to platform for many in an emergency or crisis occurred when Hurricane Sandy hit the mid-Atlantic and Northeast a year ago. 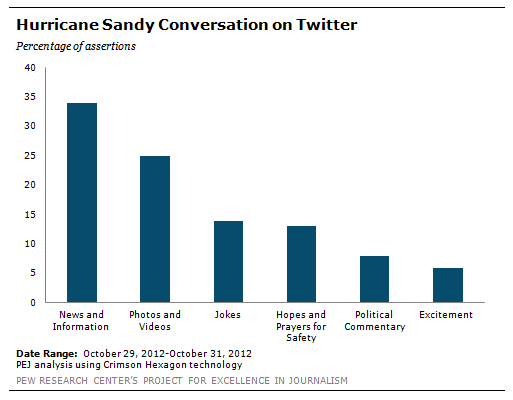 People sent more than 20 million tweets about Sandy from October 27 through November 1, according to Twitter. In New York, which suffered a widespread power outrage and many neighborhoods sustained severe damage, usage of Twitter peaked around 9 p.m. on October 29, the day the brunt of the storm hit the metro area. From the day the storm made landfall on October 29 through Wednesday the 31st, news, information, photos and video made up more than half of all the Twitter conversation, according to a study by the Pew Research Center. The largest share of this news and information, fully 34% of the Twitter discourse about the storm, involved news organizations providing content, government sources offering information, people sharing their own eyewitness accounts and still more passing along information posted by others. The second largest share of Twitter conversation about the hurricane over these three days, fully 25%, involved people sharing photos and videos. While Twitter was a source of useful news and information about Sandy, it also had the kind of downside that exists in the fast-moving environment of social media: inaccurate reports. One of the most-discussed inaccurate reports was the claim that the New York Stock Exchange floor had flooded with three feet of water and that the power company, Con Edison, was shutting off power to all of Manhattan. Several news organizations passed this information along, but others on Twitter quickly debunked it.